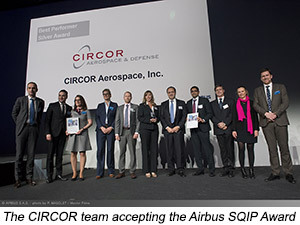 TOULOUSE, FRANCE -- CIRCOR Aerospace, Inc., a CIRCOR International, Inc. (NYSE: CIR) company, was presented with the Airbus Equipment and Systems SQIP Best Performer award for 2017. The SQIP (Supply Chain and Quality Improvement Program) award is presented by Airbus to four suppliers each year for excellent and sustainable performance on serial programs. CIRCOR Aerospace provides Airbus with fluid control components. "CIRCOR is honored to be one the companies recognized by Airbus as a Best Performer," said CIRCOR Aerospace Group President Tony Najjar. "Our Corona team made this award possible and we acknowledge their dedication, commitment and accountability to our customers." Best in Class performance for the prestigious award requires a minimum of 6 months of over 99% on-time delivery, aligned to achieve ppm below 1000, zero reported quality survey audits, and have an established strategic business with Airbus. CIRCOR Aerospace & Defense is focused on the design, development, and manufacture of specialty fluid and motion control products for demanding aerospace and defense applications. CIRCOR products are flying on most commercial and military aircraft, including single and twin aisle air transport, business and regional jets, military transports and fighters, and commercial and military rotorcraft. Other markets include unmanned aircraft, shipboard applications, and military ground vehicles. Business units are in California, New York; Paris, France; Uxbridge, UK; and Tangier, Morocco. Parent company CIRCOR International is headquartered in Burlington, Massachusetts and CIRCOR Aerospace & Defense is headquartered in Corona, California. CIRCOR International, Inc. designs, manufactures and markets differentiated technology products and sub-systems for markets including oil & gas, industrial, aerospace & defense and commercial marine. CIRCOR has a diversified flow and motion control product portfolio with recognized, market-leading brands that fulfill its customers' mission critical needs. The Company's strategy is to grow organically and through complementary acquisitions; simplify CIRCOR's operations; achieve world class operational excellence; and attract and retain top talent. For more information, visit the Company's investor relations website at http://investors.circor.com.